COMPIÈGNE, France (VN) — Mitch Docker was crushed. His Paris-Roubaix was over. As the peloton charged into the bone-rattling cobblestones at Troisvilles à Inchy, the opening sector of the 2017 race, Docker felt his tire go soft. It was the worst moment for a mechanical calamity, and Docker knew it. Docker had emotional weight behind his 2017 ride. Just one year prior Docker had suffered a horrific crash in the Arenberg Forest; he landed face first on the pavé, and the impact had severed his tongue, broken six teeth, and torn open his lip. It took months for Docker’s face to heal from the injuries, and his upper lip still bore scars. He trained specifically for a shot of redemption across the 260 kilometers of stones. Docker rode by himself for much of the day to the finish. “This race is so beautiful and it can also be so heartbreaking,” Docker added. Every year more than 170 of the world’s best bicycle racers take the line in Compiègne to race across the cobblestone lanes dotting Northeastern France’s rolling farmland. Ever year, those same riders arrive in Roubaix with new stories from their journey across the stones. The winner tells his to the television cameras, while everyone else recounts theirs to spouses, teammates, or passers by at the bar. We recently spoke to more than a dozen riders at the pre-race presentation in Compiègne to hear these smaller tales from Paris-Roubaix. We asked for stories of both triumph and defeat. What did the riders tell us? All bicycle races produce stories, yet those from Paris-Roubaix are particularly gripping and vidid. Nobody, it seems, has a boring day on the pavé. Stijn Vandenbergh had the perhaps the strongest legs of his career in 2013, when his Omega Pharma-Quick Step battled against Fabian Cancellara without their strongman, Tom Boonen. Vandenbergh seized the opportunity, and slipped off the front with Sep Vanmarcke and Sebastian Langeveld with 37km remaining. Behind, Stybar, Terpstra, and Chavanel marked Cancellara, who seemed to be outmaneuvered. 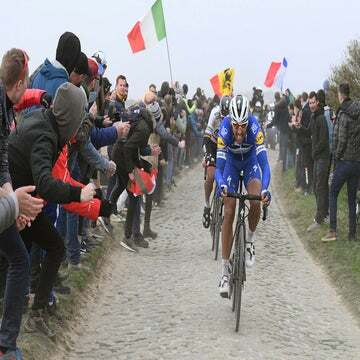 As often happens in Roubaix, a reshuffling in the final 25km saw Cancellara and Stybar bridge to Vandenbergh and Vanmarcke, and the foursome race onto the Carrefour de l’Abre with the race in the balance. And that’s where Vandenbergh’s best, and worst, memories from Paris-Roubaix. Then, disaster struck. Vandenbergh took a turn wide, and rode along the edge of the cobblestones. A fan, who was crouching too close to the road, stood in his way. TV cameras captured Vandenbergh as he crashed into the fan, tumbled onto the pave, and slid across the cobbles on his back, arms splayed out. The memory still stays with Vandenbergh. Docker attacked in the day’s early breakaway and knew he was likely doomed to finish in the bunch. 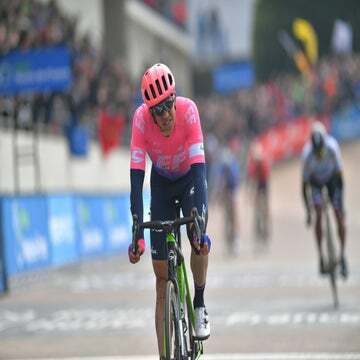 Yet he had the legs to survive the early sectors of the race and was the last breakaway rider standing when Fabian Cancellara, Tom Boonen, and the other heads of state attacked up to him. Docker wondered if he could hang on to the stronger riders long enough to see Lydia standing alongside the road at Templeuve l’Epinette. He knew he wasn’t strong enough to win, but making it that far would mark a personal triumph. Docker held the wheel until the group rumbled onto the seventh sector, and he was able to spot his wife within the crowd. Docker finished 15th overall that year, his best finish at the Northern Classic. Jens Debusschere was on the form of his life in 2015 and he knew it. Debusschere had claimed the Belgian national champion’s jersey the prior year and rode the same winning form into the classics season. So, when Debusschere rode into the front group at Paris-Roubaix, he knew he was on a fine day. His moment came when British rider Bradley Wiggins attacked to set up his teammate Luke Rowe. Debusschere followed alongside Stijn Vandenbergh, and briefly found himself riding off the front. A flurry of attacks and regroupings in the final kilometers saw a group of seven come to the line, and John Degenkolb sprinted for the win. Just 30 seconds later Debusschere sprinted with Luke Rowe and finished ninth, his best result. Our final story comes from BMC domestique Michael Schar, and it’s so weird that I figured I would simply allow Schar to tell the tale. It was 2007, Schar’s first full season as a pro. He was just 20 years old and riding for Kazakh team Astana. And he crashed before the pack even got to the cobblestones. “I didn’t see one cobblestone. There was a big crash before the first sector, and I was in the middle of the crash and broke my collarbone. They took me to the hospital, but nobody from the team picked me up. All of my clothing was cut off because I had a lot of bruises. “Finally, a doctor told me he would take me to the airport. He said, ‘Let’s go out, I have a car and I have clothing in it.’ I said I only have this hospital cape that I am wearing, but no problem, I’ll go with the hospital cape into the car. But the people from the hospital were not giving me the cape because it was property of the hospital. I said ‘screw it’ and I walked naked with a broken collarbone and lots of bruises out to his car. And at his car, he really didn’t have clothing. My bag was with Gregory Rast at the team airport. We drove, and he said I will give you my jacket, this is no problem. Nobody, it seems, has a boring day at Paris-Roubaix.